Your key to unlocking the latest exclusive offers & discounts from your favourite local shops & businesses! The Totton Local Key Card is a FREE plastic Key Card that attaches to your keyring and can then be shown in store to redeem the latest offers. All you have to do to find out where the latest discounts can be found is browse through our latest exclusive discounts & promotions, available here. 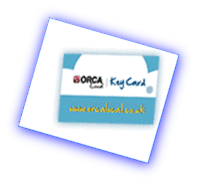 Simply request a FREE key card by clicking on the 'totton local'* button below, or whilst you're out in town, look out for "Totton Local Key Card Dispensers" or "Key Card accepted here" Window Stickers in local shops and businesses. Already Got your Key Card? Register your Key Card with us now to receive the latest exclusive money-off vouchers and discounts via email and fantastic FREE Prize Draws from local businesses! New exclusive offers are being added every day so, to make sure you never miss out on the latest bargains, register your Key Card today!